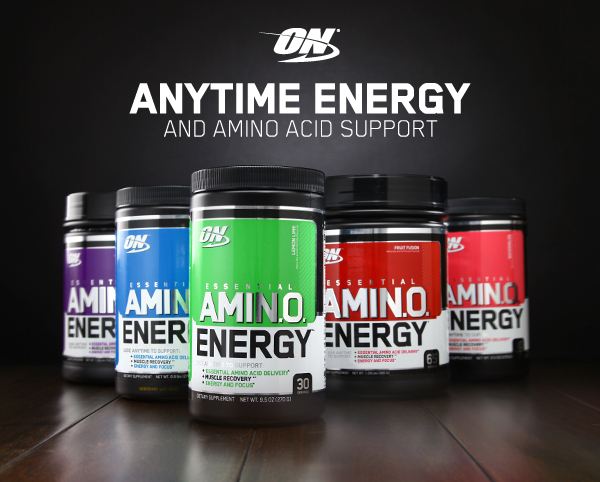 For a limited time, buy 1 Essential AmiN.O. 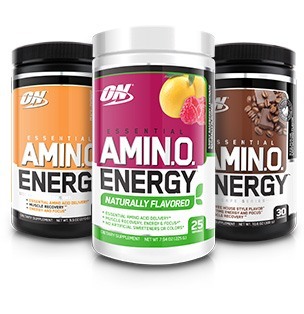 Energy, 30 Servings & get 1 50% Off! 23 UNIQUE FLAVORS* AND COUNTING! There are times when you want a hefty dose of caffeine for pre-workout performance. But on other occasions, like first thing in the morning or a late afternoon pick-me-up, what you’d get from a cup of coffee is more appropriate. 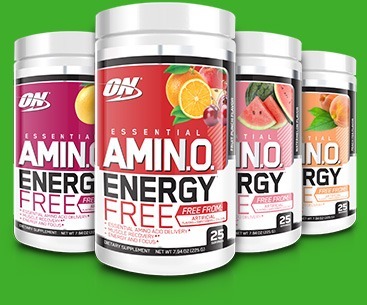 ON’s Essential Amino Energy™ offers the best of both with a formula that delivers 100mg of caffeine from natural sources per 2-scoop serving. Decrease or increase the energy level as the occasion demands. Each serving provides 5 grams of micronized amino acids. Optimum Nutrition is legendary for both quality and innovation. 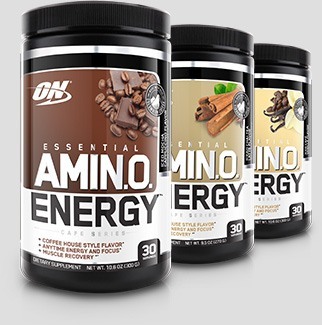 In addition to producing the world's best-selling whey protein, ON's Gold Standard 100% Casein™ introduced slow-digesting nighttime protein to the weight training world and Essential Amino Energy™ created the anytime energy category in sports nutrition. When technology makes advancements possible, ON will be the company bringing it first to your shaker cup. This product is awesome. Great to drink any time! My complain is really with the manufacturer. The 65-serving containers don’t have a seal under the lid. EVERY time I order one, it gets shaken around during shipping and a lot of it comes out. Everything in the box gets covered with it and you lose a lot of product. I only order the 30-serving size now. Tastes just like an Arnold Palmer. Very nice. I've been drinking this since 2012 and totally the same as another review - I always start my day with this (2 scoops) and 3 scoops before evening workouts. Something about the flavor just gives my senses a "ZING" and I get excited to start the day or workout. I recently purchased the larger container from another shop offline and the flavor is very different - much less intense flavor (manufactured date was almost a year ago, but it's not expired). This happens from time to time, so if you encounter a lack of flavor, I'd recommend giving it another shot from a new batch. I will not start my day without this stuff. It makes all the difference in the world. Since I’ve started drinking this every day is a good day. Been drinking this for about 3 years. I've used ON BCAAs before and like them, the natural flavors were on sale and I generally like the idea of natural flavors, but this stuff is terrible. It tastes like cough syrup and I have to force each sip. The product itself is fine, the BCAAs help with soreness and the added caffeine gives your workout a nice boost but do NOT get this flavor. 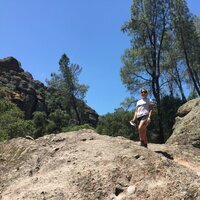 Love this product! I don't drink coffee - don't like the taste. So it's great to have something as a pick me up in the mornings before work. I am very caffeine sensitive and this doesn't make me jittery or crash. I can add an additional scoop before a workout and I am good to go! Love the Strawberry flavor - I wish that came in a larger version! The grape is DELICIOUS and I always have a large canister of that on hand. The fruit fusion isn't awful but for some reason it reminds me of soap. If it's your first time using this product or you're looking for a flavor switch, this one is THE BEST. Good BCAA, take it before, during and after workouts. On off days its a night little pick em up with100mg caffeine. Definitely good value. Use this product every morning before I hit the gym. Gives me tons of energy! Today was my first day using this product and I was thoroughly impressed by the taste. I am a huge fan of Italian ice and this flavor reminds me of eating one. This product was good for helping my muscles recover after an intense workout. Malic Acid, Natural & Artificial Flavors, Tartaric Acid, Silicon Dioxide, Calcium Silicate, Citric Acid, Sucralose, Gum Blend (Cellulose Gum, Xanthan Gum, Carrageenan), Lecithin, FD&C Blue #2, FD&C Red #40, Inulin.  Total Caffeine from all sources is equal to 100mg/9g serving. 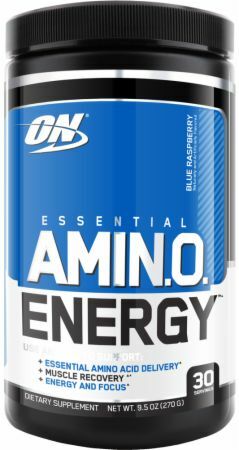 TIPS: ESSENTIAL AMINO ENERGY contains 50 mg of caffeine per scoop, so do not consume after 5:00 PM if you have difficulty sleeping. 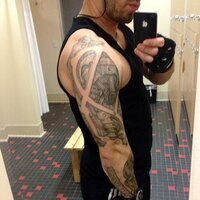 ESSENTIAL AMINO ENERGY also contains beta-Alanine and may cause a temporary tingling sensation on your skin. This is normal. With continued use, the intensity of the sensation will decrease or disappear. Also, some people may have a sensitive stomach and will not tolerate green tea extract well on an empty stomach. If this is you, be sure to take with meals. STICK PACKETS: BOTTLE OF WATER: Take a sip from a full 16.9 oz. bottle of water to make room for the powder. Add one packet of AMIN.O. ENERGY™ and shake bottle to mix well until powder dissolves. Warnings: KEEP OUT OF REACH OF CHILDREN. Check with a qualified health care professional before taking this product if you are pregnant or nursing a baby, under 18 years of age, have any known or suspected medical conditions, and/or if you are taking any prescription or OTC medications. STICK PACKS: WARNING: Consult your physician before using this product if you are taking any medications or are under a physician's care for a medical condition. Not for use by those under the age of 18, women that are pregnant, or nursing, or those that are sensitive to caffeine or beta-alanine. Do not consume caffeine from other sources while taking this product as too much caffeine may cause nervousness, irritability, sleeplessness, and occasionally rapid heartbeat. Beta-Alanine may cause a harmless, temporary tingling or flushing sensation. Do not combine with alcohol. Do not exceed 3 packets within any 4 hour period or 5 packets within any 24 hour period. Consume as part of a healthy diet and exercise program, and drink at least 100 fl oz of water per day. Exercise may increase your need for fluid intake. Phenylketonurics: Contains Phenylalanine. 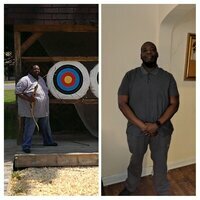 Check out other Increase Energy Products.